What does a hiring manager look for in the right candidate? Well, that depends on the job. A sales recruiter wants someone who can sell. An engineering recruiter wants someone who can engineer. So, how do you use your skills and achievements to persuade the hiring manager that you're the best candidate for the position? You need to tailor your resume to every job description, and you need to know how to use the right resume keywords. I know you're probably thinking - But that's going to take ages! It’s way easier than it sounds. Extra Read: Visit our full guide, “How to Write a Resume - A Step-by-Step Guide (+30 Examples) ,” if you need to start from square one. Some recruiters receive up to 250 resumes on average in response to an open position. Falling into that pile reduces your resume to little more than a needle in a haystack. On top of that, recruiters have developed ways to eliminate bad eggs, making their lives easier and yours harder. They use two methods - Applicant Tracking Systems (ATS) and quick scans. Both methods comprise a keyword scan. The only difference is who does the scanning - a human or R2D2 and 70% of larger companies use R2D2 to scan resumes. The only way to beat both is to saturate your resume with keywords from the job description - aka tailoring your resume. Keywords are important because it's the primary way recruiters source candidates on LinkedIn and in their HR systems (ATS). A candidate whose resume doesn't include the exact-match keywords will not show up in the search. The job description is the best place to identify the top keywords. Sounds complicated, right? In fact, it couldn’t be easier. 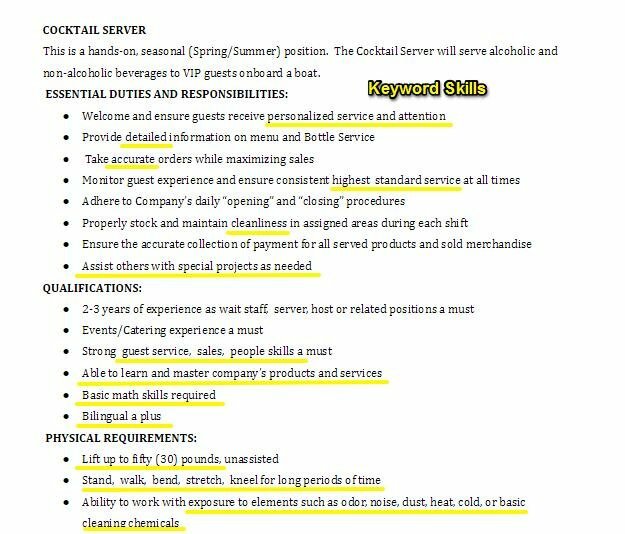 Take a look at the highlighted keywords in the job description. 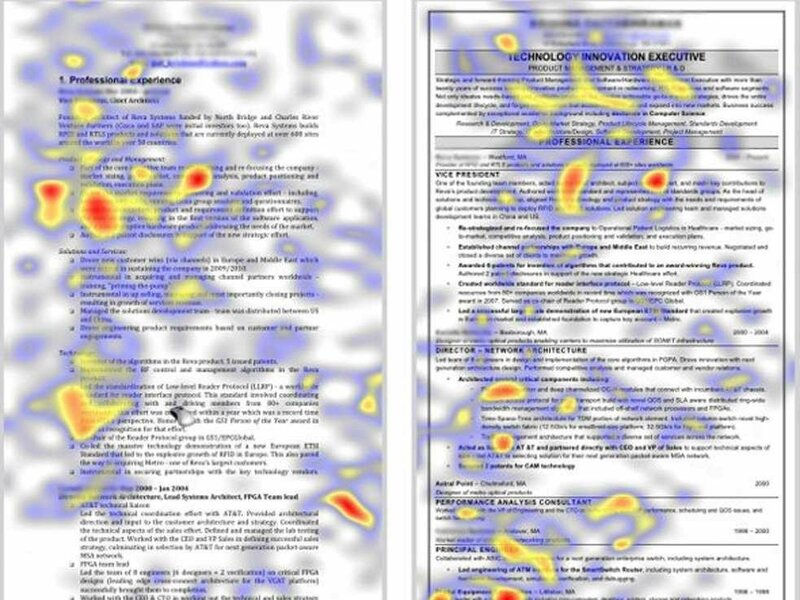 Can you see how they are reflected in the resume? You should try and put the keywords all over your resume: in the resume summary, skills, and in your experience. To start, you’ll want to make a master list of your skills. List all of the skills you have - even odd ones like being able to tie a cherry stem with your tongue. Why? Listing unrelated skills gets your creative juices flowing. Now, rank your professional skills, starting with your strongest and most valuable skills. Your list will come in handy when you want to determine which of your skills are the most important when compared to skills listed in the job description. Now, I will show you how to customize your resume and skills to a job description. Okay, you’re going to your job description for skills. And, voilà! You have keywords. As long as you have these skills, you will put all of them on your resume. Where exactly do they go? Well, that depends on their importance. And how do you know that? Start by finding a couple offers similar to yours. Next, make a list of overlapping skills. Finally, go to LinkedIn and snoop around for professionals with the job title from your job offer. Note, professionals who have done a good job of optimizing their LinkedIn profiles will have used keywords. That’s because using keywords on LinkedIn makes your profile easier to find. Here’s our guide on how to optimize your LinkedIn profile using keywords. Have a look at their skills and experience sections to find these keywords. If they match any on your list of overlapping skills, there is a good chance that these repeated skills are the most valuable and desirable. Pro Tip: Once you finish tailoring your resume to the job description, you can go back to your lists and add important skills to your resume that didn’t show up in your job offer. Here is an article on what skills to put on a resume to add extra value. By categorizing the most important skills, you can prioritize their place on your resume. That will allow you to even better customize your resume to a specfic job desciption or an employer. These are arguably the most important because they are mandatory. For example, let’s say you are applying for a position as a Software Developer. The job description says Java is required. If you don’t know Java, then you can’t do the job. Mandatory skills should go in the top third of your resume so that a recruiter knows right away that you’re qualified. You can add them to a resume summary or objective. Detail-oriented Software Developer with 5+ years of experience. Proficient in Java and C++. Note, "detail-oriented" is a typical example of an adaptive skill. More on that later. Here are two articles that explain how to write a resume summary and the only way to write a resume objective. Both will give you an idea of how to work skills into the top third of your resume. But why is the top third so important? Because that’s the first place a hiring manager looks. And remember - she’s only scanning. So, you want her to see your best skills within seconds. Check out this article on resume formats to see where other things can go on your resume. Transferable skills “transfer” from one job to another. They include things like the ability to use Microsoft Office or to speak Spanish. The master list of your best skills. Your list of overlapping skills. Find the transferable skills in your job description. Do any of them rank as overlapping skills? Are any of them at the top of your personal skill list? If so, work the top skills into your experience section. The rest can go in your skills section. These are skills that help you “adapt” to society. They include intangible skills like integrity or discretion. The best way to work them into your resume is to use them to describe yourself. Remember the example? Detail-oriented is an adaptive skill. Find the adaptive skills that are repeated across your lists and add those that you feel most strongly define you throughout your resume. Also, have you considered adding a Hobbies and Interests section? Hobbies and adaptive skills are both great ways to show off your personality. For example, to demonstrate that you are detail-oriented, prove it with a hobby that requires attention to detail. Here’s more on why and how to add hobbies and interests to your resume to show off your personality. Adding hobbies is also a good way for students to flesh out their resumes. If you’re a recent graduate here’s a complete guide to writing a student resume and a guide on how to write your first resume that will help you get started. Once you’ve got all of your keywords in place, it’s time to make them sparkle. One thing that will make your resume better than any other is demonstrating how well you use your skills. Adding details like numbers and achievements will spice up your keywords. So you write “responsible for customer service” as a bullet point under your present retail job. Stop right there. What does “responsible for customer service” even mean? First, the number will draw the eye of the hiring manager directly to this point - where you’ve written the desired keyword verbatim. Second, the hiring manager can see exactly how your customer service skills result in something tangible. When you’re in charge of customer service, customers are happier with their purchases, resulting in fewer returns. Here is the full read on how to add achievements to your resume to effectively impress a hiring manager, and here's another guide to writing your resume job descriptions right. When you’ve finished tailoring your resume, it’s time to check if you did a good job. Try dropping your resume into a cloud generator. It will show you how frequently you’ve used a word. If your keywords aren’t prominent, consider adding them more than once. Did you perform that skill at multiple jobs? Keep in mind that the robots can sense whether you’ve added skills ad hoc or in a meaningful way. Next, check out Jobscan’s ATS simulator. Drop your job offer and your resume into their tool to see how well you’ve used keywords. It’s ideal to have a match over 80%, if not Jobscan will provide you with personalized tips on how to do better. Pro Tip: You will also want to tailor your cover letter to the job description by adding keywords. Here is our complete guide on how to write a cover letter. Tailoring your resume to a job description is a must. And it’s the one piece of advice to rule them all. By tailoring your resume to the job description, you signal to the hiring manager that your resume is relevant and that you’re the right person for the job. So if you’ve ever wondered why you’re not getting called to interviews, maybe it’s time to rethink sending that generic resume and get busy tailoring to every job offer. Still not sure how to tailor your resume to a job offer? Find any of the advice above confusing? Let us know in the comments, and we will get back to you. Thanks for reading!